Mukto-Mona Writers' Corner - Palestinian Homeland – How Much Blood to Shed? Home/History, Human Rights, Politics, Religion, Uncategorized, war crimes/Palestinian Homeland – How Much Blood to Shed? It has been quite astonishing to hear recently from the Saudi crown prince that Israel has the ‘right’ to live in peace on ‘its land’! His comment coincided when Israeli troops killed 16 Palestinians and injured more than 1000, while they (Palestinians) were observing their Land Day just four days ago. In the recent demonstration so far altogether 30 Palestinians were killed and more than 2000 injured. Saudi prince’s comment seems astonishing in a sense when he uttered ‘Israel’s land’, what did he mean by that? 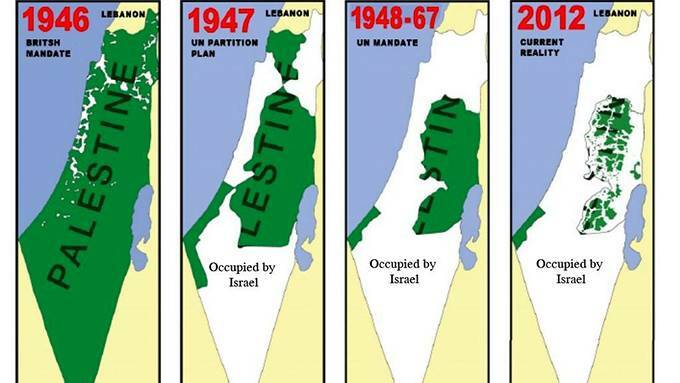 The question is which part is actually Israel’s land? Any rational human being having known the history of longstanding Israeli-Palestinian conflict would say it is the land of Palestine that is now being called the land of Israel! If it is so how can Saudi prince certify Israel to have its right on the land per se? History says the truth, doesn’t it? In this article, I want to go back to the time when the vast land of Palestine was captured forcefully and handed on to the Israelis (Jews). And since then the saga of bloodbath has been continuing without end on the land of Palestine. Before the First World War Palestine was part of Ottoman Empire of Turkey. Palestine had a robust population of 700,000 with a land size of 10,500 sq miles. In 1917 the Ottoman Empire, then Turkey was against allied force, fell in the hands of the British. The British then captured Palestine and kept it under its control until 1948. It was during this time British government thought of a separate homeland for the Israelis on Palestinians’ land. The then British Foreign Secretary Lord Arthur Balfour wrote an idea in a letter to Lord Walter Rothschild, a leading member of Jewish Community in Britain, on how to extract the land in Palestine for Jewish settlement. This letter is historically called as ‘Balfour Declaration’ which promised the Jewish community a separate homeland at the earliest. After 1933 Adolf Hitler became very tough on the Jewish community and as a result, hundreds and thousands of Jews began to pour into Palestine. This made the Palestinians feel that their existence on their ancestral land was at stake and so they started attacking Jews and British soldiers. However, the British army responded with an iron hand. In mid-1939 British government published a white paper which said that in the next five years 75 thousand Jewish immigrants would be settled in Palestine in phases. Furthermore, British government enrolled 32 thousand Jews into its army and trained them to fight the Arabs and Palestinians on the land of Palestine. In the meantime, Hitler’s Nazi forces killed 6 million Jews in the Second World War. After 1945, a question raised as to the future home of remaining Jews who survived Hitler’s holocaust. And as a follow-up of British plan, it was decided that there would be an independent homeland for the Jewish community on Palestinian soil. At around that time US president Harry Truman also very strongly raised a voice in favour of a Jewish homeland in Palestine for 100,000 Jews, who survived Second World War. Harry Truman’s support gave strength to the Jewish community to create pressure on the British government to put forward the Jewish homeland issue at the United Nations. In 1947 the United Nations took a resolution (181) to create two independent nations (Israel and Palestine) for Jews and Palestinians in Palestine. In terms of population size, the Jewish community deserved only 10% of Palestine, but it was decided by the United Nations apparently propped up by UK and USA that Palestine would be divided into two equal parts for Jews and Muslims. Although Jews became very happy to have Israel as their future independent homeland, the Palestinian Muslims rejected the UN resolution denoting it as an occupation to their birthplace. Consequently, violence erupted between Jews and Muslims. The Muslim demonstrators besieged Jews in Jerusalem, which Muslims claimed to be their part. In March 1948 the Jews struck back on Muslims and took control of Jerusalem. On 14th May Britain decided to withdraw from Palestine and the then Jewish leaders decided to declare independent Israel the following night and which they did. Interestingly, within very short notice the American and the British recognised independent Israel! On the other hand, within one hour of the declaration 5 Arab countries jointly attacked Israel to take control of Arab Muslims’ holy land Jerusalem. The countries were Egypt, Iraq, Lebanon, Jordan and Syria. The strong blow from the Muslims forced Israelis (Jews) to retreat. Apprehending impending defeat Israel called for a ceasefire through United Nations. During the ceasefire, Israel bought a huge amount of weapon from Czechoslovakia and started capturing a number of important places of Palestine. Heavy fighting between Jews and Muslims continued. In 1949 there was another ceasefire. Until the ceasefire, more than 6 thousand Jews were killed. Afterwards, Israel grew up economically, politically and militarily with huge support from the USA and Western world. At one stage they become a superpower and engaged in another war with the Arab countries and captured Jerusalem and West Bank. Since then Palestine has become a territory of chronic contention, violence and war between Jews and Muslim. The unjust arrangement of the United Nations actually created major global disorder and conflict among Muslims and western nations supporting Israel. Just see how a small strip of Israel has become a great country, gradually occupying Palestinian territory with support from British and Americans. At present Palestine has been reduced to only West Bank and Gaza, nothing more, and completely besieged by Israel in regard to land, air and sea. Even these West Bank and Gaza are on the process of further occupation on the plea of Israel’s security and there is no remedy from the United Nations or any western world whatsoever – let alone declaring an independent Palestine. The recent violence relating to the observance of Land Day is another example of Israeli killing of Palestinians. Unless an independent Palestine is in place with the release of the occupied land and a rightful authority is given to the Muslim on Jerusalem, this saga of bloodbath will never cease. I was reading in this forum and found the incidents in Bangladesh where Hindu Homes were burnt by false allegations, Hindu locked up in jail without proof and then I find this article where people writes about injustice in a far away land. I agree that violence in Palestine should not happen but also believe the same should not happen in Bangladesh too against the Hindus. Why cant i scrap your comments count? ?